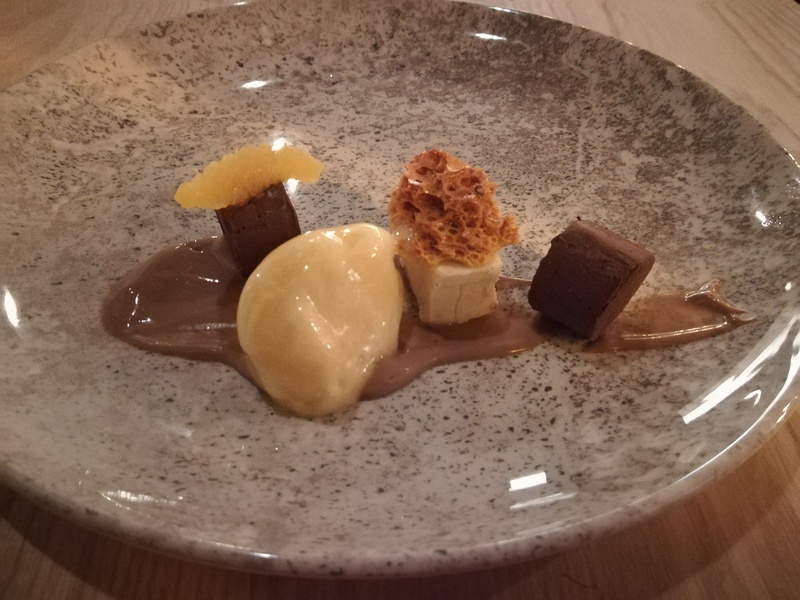 This month’s MiniMoFo is all about desserts, and inspired a lengthy discussion between Dr HH and me about the best 5 we’ve ever been served. Here are our conclusions! Like most British people, I find chocolate orange to be one of the defining flavour combinations of the festive season. So this dessert from The Allotment’s Christmas menu was extra special. The orange sorbet was delicious, the honeycomb and nougat were exciting treats, and the chocolate truffle was sublime. 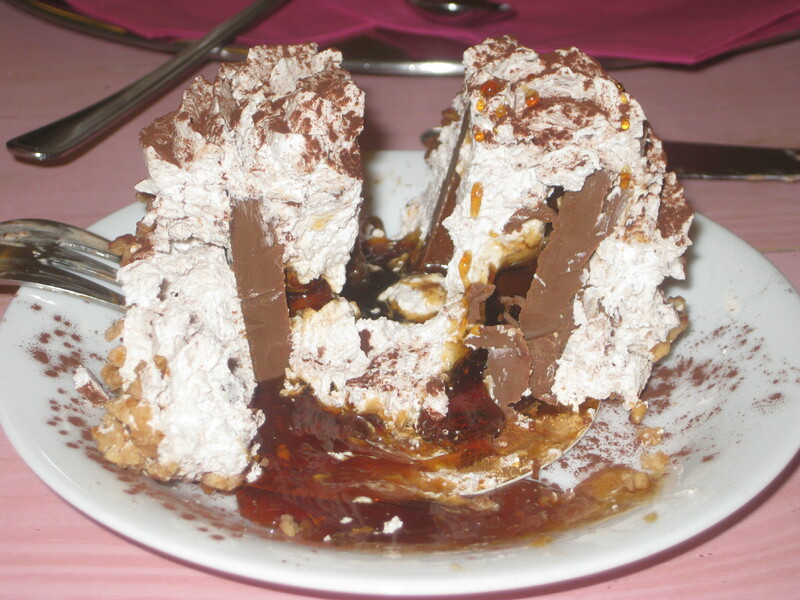 This is what is known as a proper pud. It’s supremely comforting, and stick-to-the-roof-of-your-mouth delicious. I’m devastated that this place has closed down its cafe, but looking forward to doing some thorough research at their cake counter in central Manchester. 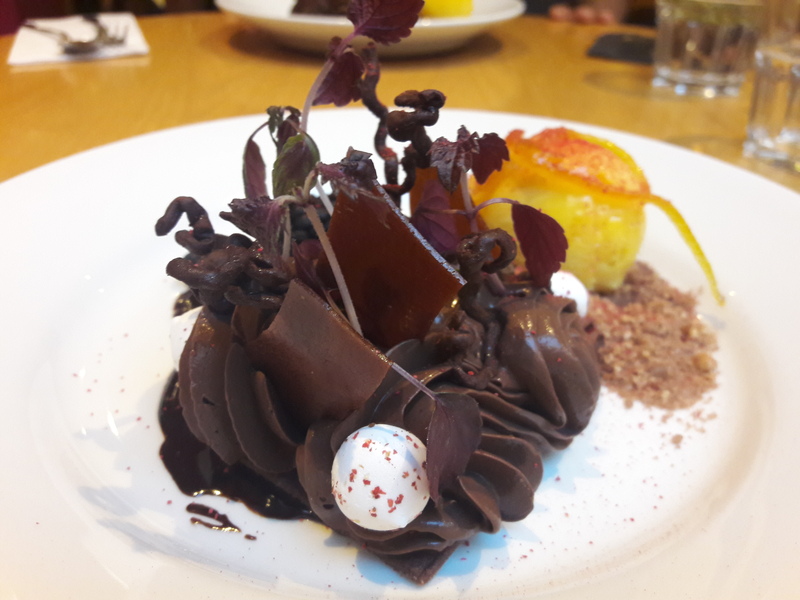 We planned an overnight stay in Bath just so I could try this dessert, and it was definitely worth it! It was a rich tart with a crumbly base and, yes, a dollop of peanut butter sorbet. 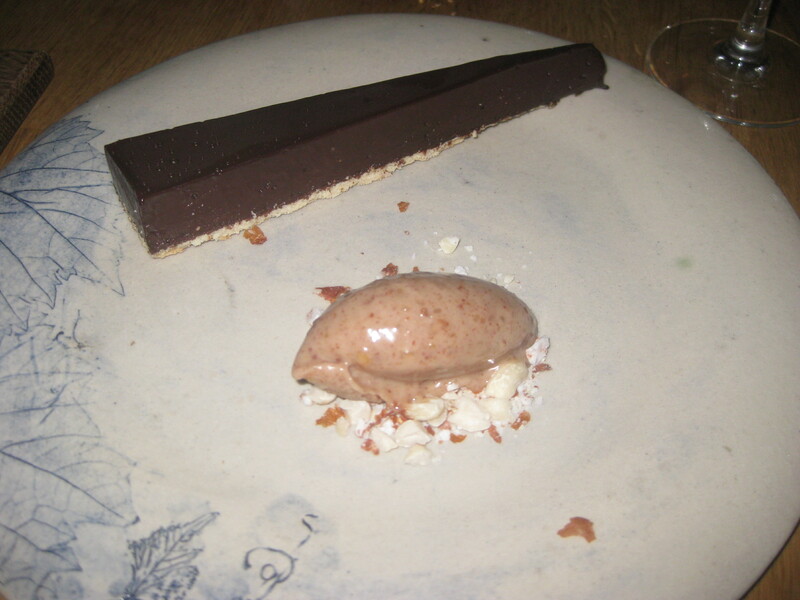 And when I say dollop, I of course mean “quenelle” – that’s how fancy this was. 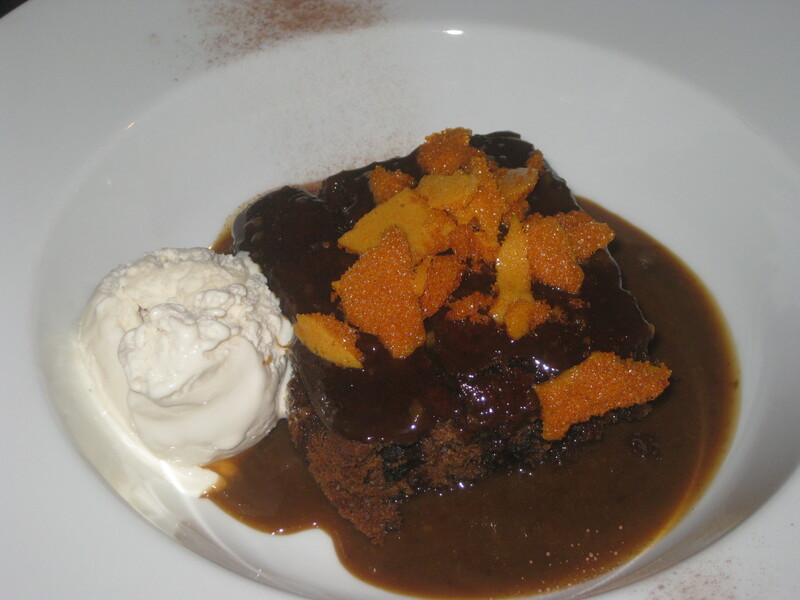 We had this dessert just last week, and it has already stormed its way into the top five! The more discerning reader may have picked up on my love of extremely decadent, rich, chocolate desserts, and this one was no exception. The chocolate mousse was outrageously good, and the shortbread crumbs, mini meringues, orange sorbet, and chocolate shards were beautiful additions. 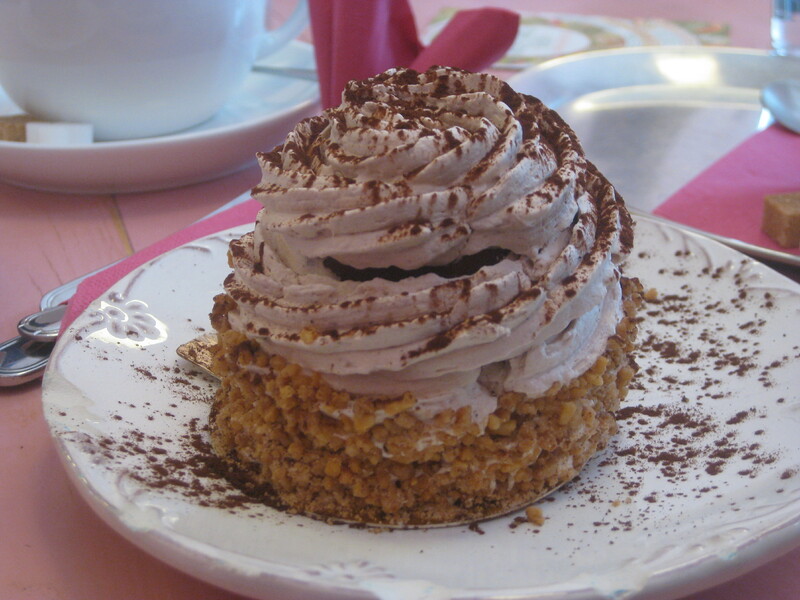 Help me plan my next holiday, tell me where you found your top desserts! 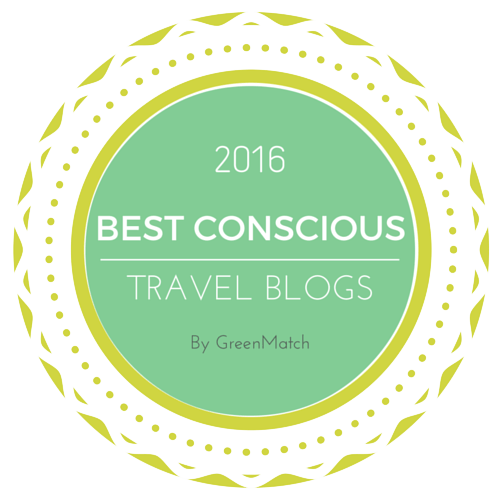 This entry was posted in Travel and tagged Acorn Vegetarian Kitchen Bath, MiniMoFo, Oh La La Berlin, Teatime Collective Manchester, Terre a Terre Brighton, The Allotment Manchester, vegan dessert, vegan travel. Bookmark the permalink. I don’t eat dessert often. I rarely eat out, and never save room for dessert. BUUUUT I did LOVE the dessert from Vedge. It had so many amazing flavors! Who knew that miso ice cream would be awesome?! Miso ice cream sounds wild – I think I might just be bold enough to try it! I miss Oh La La so much! It was my very favourite place in Berlin. That new dessert from Terre a Terre looks wonderful, I’ll have to try it as soon as I can! I miss it too! I’ve never seen anything quite like the tresor.